Sky Blue Trust unveil faceless statue of Joy Seppala at Ricoh Arena. At the recent fan’s forums, Chief Executive Tim Fisher joked that a staue of SISU boss Joy Seppala should be erected at The Ricoh Arena, and The Sky Blue Trust have used this idea as their latest protest against the club’s owners. Fisher has publicly stated SISU’s desire to build their own stadium, which would mean City ground-sharing with a fellow club in the meantime, as SISU say City have been ‘locked out of The Ricoh,’ a claim denied by stadium managers ACL. 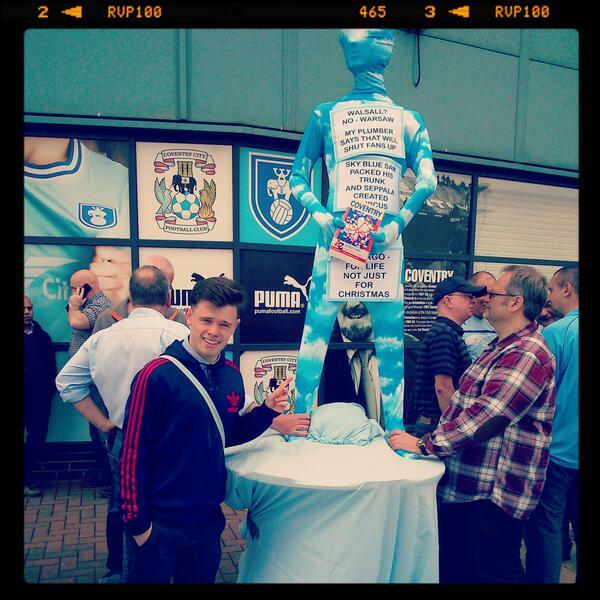 At 12:00 BST, a faceless ‘statue’ was unveiled in front of a large crowd next to the statue of club legend Jimmy Hill. “It’s really important fans keep up as much pressure as possible to stop the plan of moving Coventry City outside the city of Coventry, which we know from the [Coventry] Telegraph’s poll and our own members is massively opposed by supporters. ”Building on our recent successful London protest, the Trust’s next event will be at noon on Saturday by the Jimmy Hill statue at the Ricoh Arena. “The event will be based on Tim Fisher’s recent suggestion that fans should erect a statue of Joy Seppala. Supporters will therefore unveil a ‘statue’ of Ms Seppala so people can look at the Jimmy Hill statue and think of all he achieved for Coventry City and perhaps then reflect on the current owner’s plan to move home games out of Coventry. “It’s a light hearted way of conveying the very serious message that we must keep Coventry in Coventry. Today’s demonstration followed one outside SISU’s headquarters in London earlier this month. « Nine players sign scholarships with Coventry City.